As someone who has followed the Fashions on The Field competitions closely for a very long time now, I would say that I have a pretty good idea as to what the judges will be looking for. The overall look has to be couture-like and polished while keeping on trend. There are so many competitions at many different venues throughout the year which you could enter to gain some experience. It’s good to try some smaller ones to get the hang of what it’s all about before entering the larger ones. Do keep in mind that the smaller competitions (held at country race meets) may be seeking a totally different look to what is sought after at the major city ones. The most important thing to always keep in mind is to enter for the fun of it. If you’re entering with high hopes of winning, you’re more than likely going to be disappointed. Over the years of being in the Fashions on The Field scene, I’ve met some wonderful people and made some lovely friends. It’s so nice to turn up to a competition all on my own, and there’s never a shortage of a friendly conversation. If you’ve got a passion for fashion, you’ll be able to chat up a storm with any of the other contestants – especially the serial entrants. These ladies love discussing fashion! Ladies start planning their outfits months in advance! Some choose to make their own outfits while others choose to spend up large! You just have to appreciate and admire all the different designs and the amount of effort which goes into putting these outfits together. It’s a great scene to be part of if you love fashion. Don’t think that you always have to spend a fortune, some winners have been dressed in outfits made by mum or even themselves! If you’ve got some creativity, think about creating some original looks. It can get tough turning up to a fashion competition with someone else wearing your outfit! Millinery is something which is a little more difficult, unless you know how to make a hat or headpiece. There’s many milliners who can help you achieve your desired look and it may not cost as much as you think. It’s worth looking into. 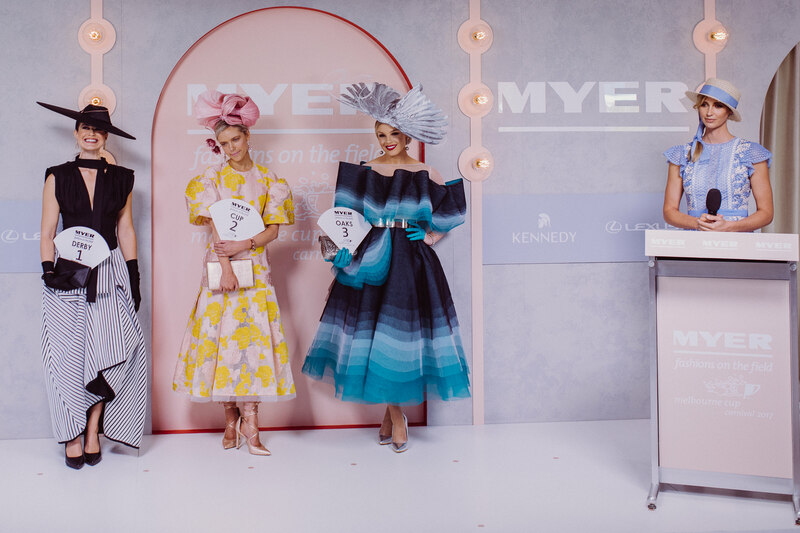 Looking back at all the winners of the major Fashions on The Field competitions, one look stands the test of time – Modern Classic. This look is a fusion of classic and modern style. It’s not too tricky to pull off and is a winner if done well. Here is a guideline of how to put together a modern classic winning look. Hemlines are modest, generally below the knees but above the ankles. The skirt can be either fitted or flared. The neckline can be high but not too low (no cleavage showing). Stick with a modern neckline. Some can look too old-fashioned. Some sleeves are required. Shoe-string straps or strapless hasn’t been favourable. Luxe fabrics are used, or combining textures. Look out for garments which look expensive, even if they’re not. Combine colours and different textured fabrics. Classic colours which aren’t too bold and bright. Both black and white have done well, depending on how they are styled. Bues, pinks, neutrals are also favourites. Go for colours which don’t hurt the eye. Accessories play an important part in finishing the outfit so select carefully. Don’t go too matchy-matchy with them. Wear bold statement pieces which compliment your look. Shoes can make or break an outfit. Invest in a good-looking pair. Millinery is super important. It has to flow with the outfit. Again, don’t go too matchy-matchy. Wear something which suits you. Whimsical pieces tend to go un-noticed. Boaters are always a classic look which will stay forever. They’re a little too popular. If you want to stand out, an artistic sculptural piece will get you noticed. Cheap headpieces from your local department store just won’t do. 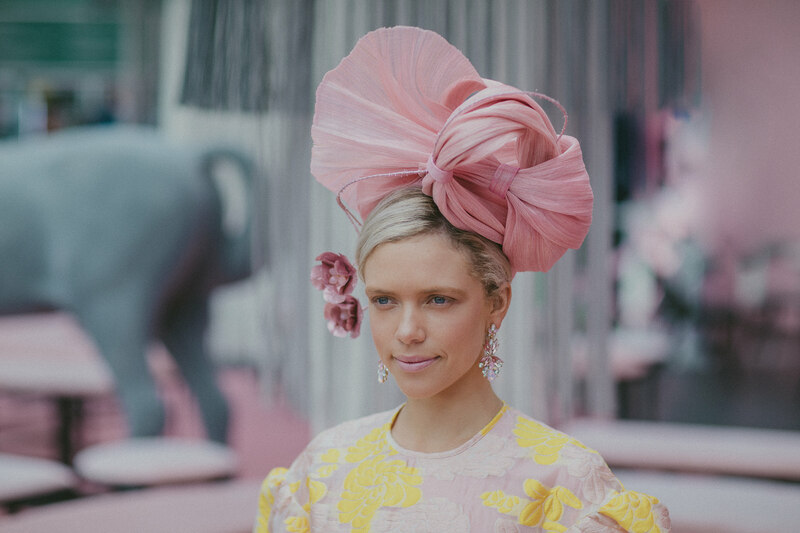 Whimsical crowns are fun and easy to wear but not for Fashions on The Field comps. Avoid too vintage-looking outfits. I love vintage style, but a dress from the 50’s or 60’s has never done well in these competitions. Use the style from that era as inspiration and put together a modern version of it. Your whole outfit must have a well finished couture look for you to stand a chance in the major competitions. Whatever look you put together, remember the most important thing – you have to feel great wearing it! Dress in what makes you feel good and not in what you think others would like. A smile is the best accessory a girl can wear! On the day of the competition, here’s a checklist to make sure you are race day ready. 1) Appropriateness of outfit – think about the type of competition you’re entering. Is there a brief about what the judges are looking for? Is your outfit on-trend or a classic look? Are you dressed correctly for the weather? Take a wrap or a jacket to keep yourself warm on a cold day. 2) Finishing touches – are your nails done? Is your hair nicely styled? Are your accessories on you? 3) Make sure your shoes are clean. Take along a pair of flats. Put your heels on when you get there to save your feet and walk home in comfort. 4) Clear eyes – red eyes are not a great look. Making sure you get sufficient sleep the night before is the best solution for this. If your eyes are red, use eye drops to help them out. 5) Be there early to find out where to go and to sign in. They’re strict with signing in times and I have seen a beautiful young lady reduce to tears because she was just too late to enter!